When visiting Sedona, why stay in a motel room equipped with a TV and perhaps a coffeemaker, when you can have all that Sedona Pines Resort offers for about the same price. 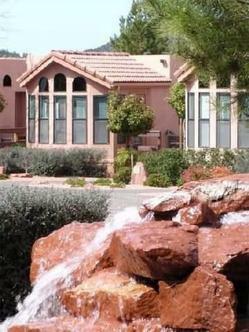 We're a family resort nestled among the world-renowned Red Rocks on the western edge of Sedona. Individual cottages - one story only (no overhead noise) using a superbly constructed and quiet modular design. Each cottage surrounded by beautiful landscaping complete with peaceful fountains and other water features. Units are air-conditioned and come with a full kitchen with microwave/convection oven, telephone, TV, VCR, dishwasher, whirlpool bath and CD/stereo system. Our resort offers the largest heated pool in the Sedona area, 2 spas, fitness room, free 18 hole miniature golf, sportscourt and wonderful restaurant serving lunch and dinner. Most area features are just a short drive from the Pines and many tour companies will pick you up at the resort.